One tablet of the max strength dose is approximately equivalent to three of the previously stocked 80,000iu tablets. If you still wish to give the lower dose version, SerraEnzyme is the same product (just a different label for marketing purposes), which is still available in the 80,000iu dose. For best results give separate to when feeding protein (meat etc). 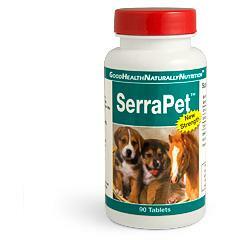 Serrapet does not inhibit any bodily function but protein does reduce the function of Serrapet. A number of vets have been using SerraPet enzymes for arthritis and many other animal conditions and the signs are more than encouraging. So far they have been giving the supplement to dogs, all severely affected with arthritis and all in a great degree of pain. There have been no side effects and pain relief has been almost total. Being a dietary supplement rather than a drug means a possible breakthrough for non-drug animal arthritis sufferers. Microcrystalline Cellulose, Mannitol, Vegetarian Magnesium Stearate and Nutrateric® enteric coating.